So it seems counter intuitive to remove a cover especially when every pool company in America says you need one. 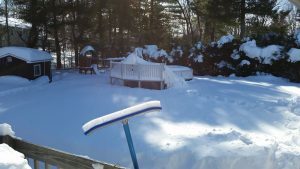 The point of this blog post is to inform you that yes your pool needs a cover BUT, you will need to pay attention during winter and especially early springtime. The weather can be very spontaneous during early springtime. It can be 65 degrees one day followed by 15 degrees at night time. This represents a issue with an above ground pool which is holding water “ABOVE GROUND”. Holding water up into the air is a big deal and the constant freezing and thawing is causes some above ground pools to fail from winter damage. The pillows that people add underneath the pool cover is necessary to break up the ice so it doesn’t freeze into one large block of ice. These pillows almost always lose air during winter and do not do their job. So you get this giant block of ice which is subjected to the up and down temperatures. When temps are on the rise this block of ice can easily shift and when a giant block of ice shifts there isn’t much that can stop it. The pool wall made of rolled sheet metal is designed to hold back liquid. A giant block of ice concentrates its energy in one area causing a pool wall to blow out. 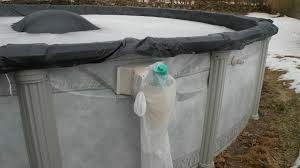 If a pool cover is secured so tight it offers no support to a giant block of ice and this downward pressure locks the cord under the frame and the next thing you see is the top of the pool going inward causing a real mess. This is of course an extreme case and most kinds of winter accidents result in less damage. The pool liner can suffer great damage as a result of winter as well. When ice forms in your pool it is thickest at the top where it meets the cold air. Next thickest is the sidewall and as ice works its way down toward the base it is not as thick as the top and sides up higher. When temps rise in the springtime the ice is thinnest at the bottom and this creates a knife like shape towards the bottom where the pool wall meets the base. The top gets to heavy and then it drops down and stamps out the bottom of the pool liner all around where the wall meets the floor. This kind of damage calls for a new liner and perhaps some floor repairs. Another cause of winter damage is when snow is piled so high on a pool it becomes too heavy. When snow starts to melt it becomes heavy. This weight can place unwanted pressure on top of the pool causing a possible pool wall collapse. So know you now a few things about winter damage that could occur to an above ground pool. Next let’s offer a couple suggestions to help you. First let’s start off by stating, just because you hired a professional to close down your pool doesn’t mean you are protected from any kind of winter damage. I have seen situations where people feel that hiring a professional contractor to close their pool that they are now protected from anything bad happening, it is just simply not true. It is important for a good closing but let’s refer to following suggestions/tips to help guide you. First line of defense is to monitor your pool during the winter months especially late winter and early springtime. If it becomes necessary, go ahead and cut the cord that keeps on the pool cover. I know it sounds counter intuitive to cut something that was placed there for purpose. I can tell you this with 100% accuracy. “It is better to clean debris from your pool than it will be to replace the entire pool”. 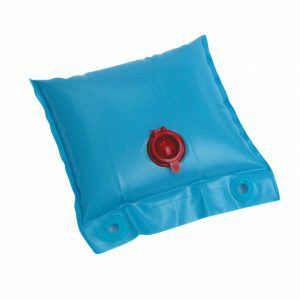 A second solution is to use wall bags on the pool cover instead of the cord. This will allow enough pressure to keep cover in place and if enough weight is going the wrong direction then the cover will be allowed to fall into pool without hurting the pool in anyway. Another less tried approach is to lower the water level after leaves and debris of fall have fallen. Once the all the debris falls simply lower the water level so that your pool is about halfway. This will allow the block of ice that forms to be smaller. This should result in less weight inside and if this should shift than the chances of it doing more damage is lessened. Do these suggestions offer 100% protection? No, they are just suggestions for you to consider. About 99% percent of the time pools make it through the winter just fine and all this is just precautions for that 1% of the time it could happen.